Firstly it is a tried and tested sprouter! Already re-designed in the USA, to perfection, more than 10 years ago. This great, easy to use sprouter is made of one of the few non-leaching BPA-Free high density polyethylenes. Have you ever seen a sprouter that can give you a pile of sprouts like this? (The below image has Alfalfa sprouts, and just see how big and succulent they are). The unique patented design offers both of these factors to ensure that you will enjoy kilos of healthy sprouts - no green fingers required. The dual-container sprouting system uses heat from growing sprouts to circulate fresh humidified air by convection. Prevents suffocation and dehydration so sprouts need less (or NO) rinsing. Special Insert for small seeds such as alfalfa and clover. The benefit of running multiple EasySprout sprouters is ready-to-eat sprouts in the refrigerator. This is facilitated by the newest three-part Sprout Keeper model (inner & outer + vented lid ). 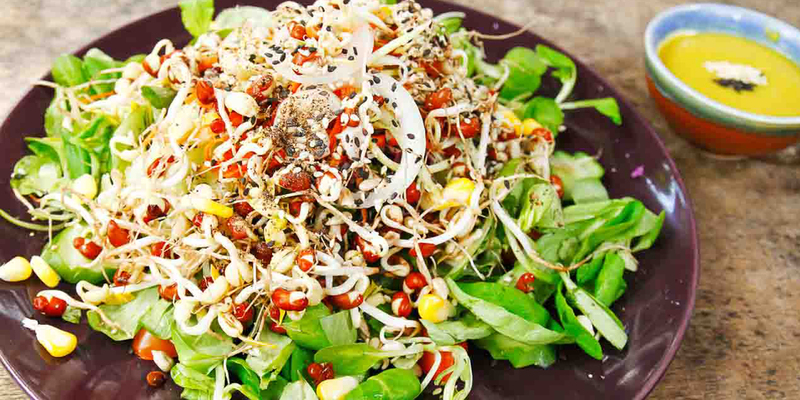 Conveniently produce 1/2kg batches of healthier, tastier sprouts faster with minimal effort. Superior Air-Circulation (One of the most forgiving sprouters ever designed). Will sprout virtually any seed. Compensates for hot, humid conditions with a dynamic air-flow design. Simplified and enhanced "Travel Sprouting". Growing capacity = 1 litre. Made of BPA free High Density Polyethylene. Special insert to prevent small seeds like alfalfa and clover falling through. Ventilated dome lid that doubles as a measuring cup. The EasySprout sprouter can produce up to 450g of leafy sprouts or 900g of bean or grain sprouts. Excess water drains into the solid base, so you can leave it anywhere without worrying about making a mess. With the snap on vented flat lid, which allows great air circulation even with the growing vessel sitting down in the outer container, you can take your EasySprout sprouters everywhere you go. Now you can EasySprout while travelling!